Includes one wire shelf and two stationary wall mounts. 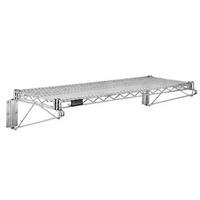 Eagle wire shelf features patented QuadTruss® design (patent #5,390,803), making shelves up to 25% stronger and provides a retaining ledge for increased stability and product retention. Available in 14" and 18" (356 and 457mm) widths, and 36" and 48" (914 and 1219mm) lengths. No tools required to attach shelf to wall brackets. Units available in chrome, Valu-Gard® green epoxy, or stainless steel finish.